more modern paper or washable non oil bath filters? (quoted from post at 16:40:27 09/15/12) Why? Because you can get 'more horsepower & better mileage' with a K&N! Don't you read the K&N adds in Hot Rod mag??!! My original is trashed. Might be a better deal up here at 8k feet to use replaceable filter like paper or K& N I use the K&N on my 66 390 ford. 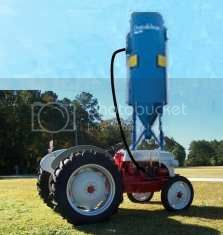 Seems like I saw a picture of a K&N filter on an N tractor. Just slipped over the carb opening and pointed straight back. Held in place with a hose clamp. Don"t know how well it will work with so much dust flying around a tractor. ??? This last one might actually be ok.
all the time in full choke. I have a geo metro 3 banger that has room for an oil bath. There just isn't much dust and I don't drive allot. But it would be interesting. I think a problem with OB filter is handling a high flow engine. Though, I do seem to recall OB on old ford V8s. (quoted from post at 13:44:09 09/16/12) I have a geo metro 3 banger that has room for an oil bath. There just isn't much dust and I don't drive allot. But it would be interesting. I think a problem with OB filter is handling a high flow engine. Though, I do seem to recall OB on old ford V8s. (quoted from post at 02:44:09 09/17/12) I have a geo metro 3 banger that has room for an oil bath. There just isn't much dust and I don't drive allot. But it would be interesting. I think a problem with OB filter is handling a high flow engine. Though, I do seem to recall OB on old ford V8s. My 1976 F250 4x4 came with an oil bath filter. An oil bath air cleaner? Paper filters plug fast with dust,One wet with gas will plug even faster. What is "trashed" on yours? If you can make a good one out of yours and the parts I have send me an email. 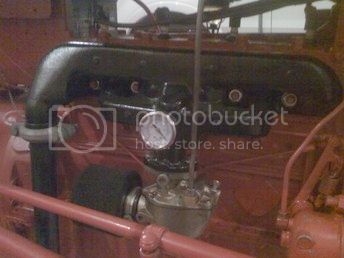 Early Ford V8s used an oiled mesh filter.Oil bath was an option until 1942.In any case a paper filter on an updraft carberator could become soaked with gas and catch fire.